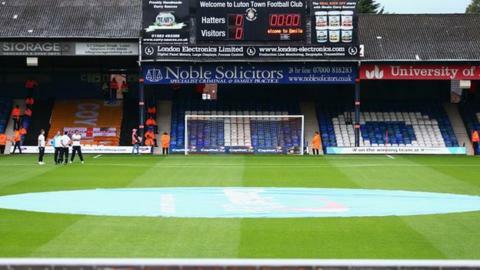 Luton Town have identified the Power Court site, near the town's railway station, as their ideal location for a new 17,500-seater stadium. The Hatters want to move into the new ground by 2020 and will submit a planning application in the summer. The club hope to develop land they own near junction 10 of the M1 with retail, leisure and office facilities to help fund the cost of the Power Court site. Chief executive Gary Sweet explained that the club have been looking at the Power Court site since 2008, despite it having numerous issues. A river runs through the middle of the site, it houses a substation and the land is contaminated. But Sweet insisted that the cost of restoring the site would not plunge the club into debt. "In our minds I don't think there was ever a site that was better than Power Court," he told BBC Three Counties Radio. "We never really appreciated it was a reality because it is a very difficult site to develop. "The football club will not be in debt as the funding for purchasing those pieces of land will come from private investors that are involved with the football club now. "It will be completely independent of the football club and will have not impact on the club."